Faster updates will mean fewer big changes between future preview builds, Microsoft says. Microsoft has issued a new preview build for Windows 10 Insiders, but it’s light on noticeable changes. That’s partly because Microsoft has quickened the pace at which it updates the “Fast ring” of preview builds, according to Gabe Aul, vice president of the company’s engineering systems team. Microsoft also has a big feature update coming (likely codenamed Redstone), and the latest build is largely about laying the foundation, Aul said. It’s worth noting that Microsoft has reportedly dialed back its feature plans for Redstone as the company has shifted resources to fixing Windows’ underlying structure—something Aul may be alluding to in his blog post. As Petri’s Brad Sams reported last month, Windows previously relied on an outdated process for submitting code and troubleshooting bugs, in which employees had to wait up to an entire day to see if their features and bug fixes worked properly. By fixing these systems, Microsoft is able to release and test new builds faster. Still, the latest Build does have some fixes worth noting. For instance, pasting files into a new .ZIP file should now work properly, and suggested apps should no longer appear in the Start menu if users have disabled this function in Windows Settings. Check out Aul’s blog post for the full list of fixes and known issues. 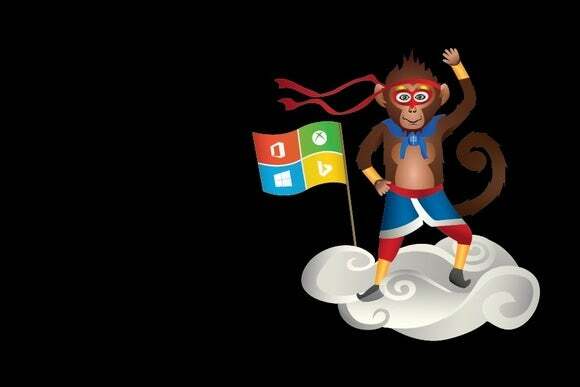 Oh, and Microsoft is also celebrating the latest build—and the lunar new year—with a fresh desktop wallpaper. If your ninja cat riding a T-Rex is starting to feel stale, you may now replace it with a ninja monkey. Why this matters: Beastly stealth assassins aside, the latest preview is more a sign of things to come than an immediate improvement for Windows Insiders. With any luck, it will lead to a more stable, dependable operating system, even for users who aren’t on the Fast ring.